I have a recipe for Raspberry and Green Tea LimeMelties that I think you will LOVE. It is low in sugar, antibacterial, and high in good fats. Melties taste like cheesecakes but they are dairy free (I recommend being dairy free to rebalance your hormones naturally). The healing ingredients include coconut butter, lime juice and lime zest (full of d-limonene which aids liver and hormone detoxification). Whether you need a satisfying snack in the evening or a quick dessert for a dinner party, these melties have a good chance of becoming a staple in your house, as they are in mine. Make the meltie base and then choose the raspberry or green tea option. In a medium bowl, combine the coconut butter, grated lime peel, lime juice, honey, vanilla extract, coconut oil, and salt and whisk until well combined. The hot coconut oil should soften the coconut butter, but if the coconut butter remains lumpy, microwave the mixture for 20 seconds and whisk again until a smooth paste is formed. For Raspberry Melties, place one raspberry in each mini-muffin cup and then cover it with slightly less than 1 tablespoon of the meltie base. 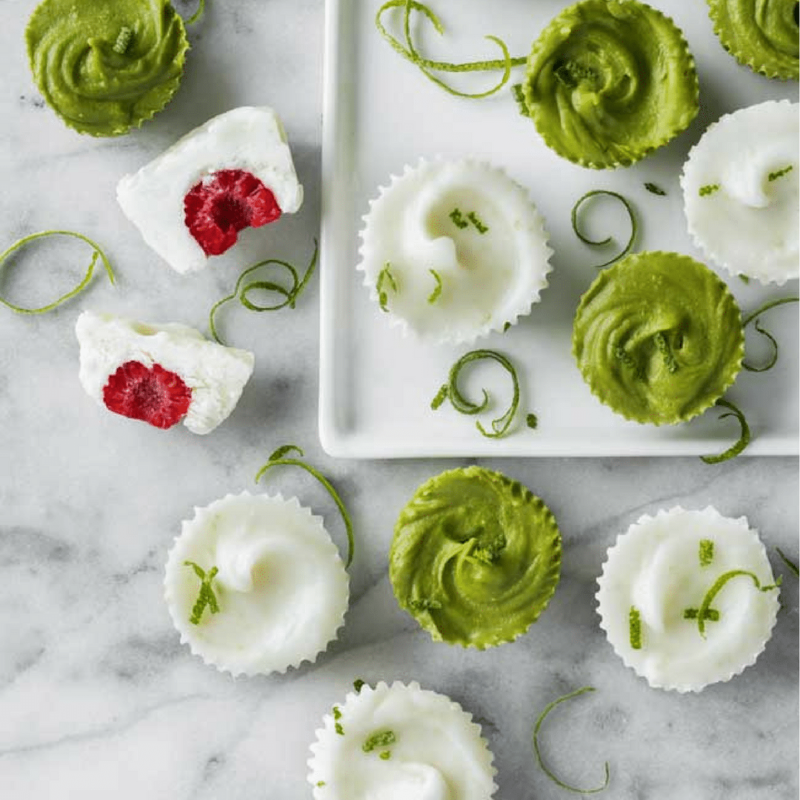 For Green Tea Melties, whisk the green tea powder into the meltie base mixture and scoop slightly less than 1 tablespoon into each mini-muffin cup. Garnish the melties (both kinds) with grated lime peel. Place in the freezer for 20 minutes or until hardened. Keep in an airtight container in the refrigerator for up to 10 days. Anti-Candida: Replace the honey with six drops of stevia. Low-Fodmap: Replace the honey with coconut nectar or Grade B maple syrup. Can you please explain what do you mean by coconut butter. Is it the same as coconut oil or is it coconut cream from a can? I tried these little gems this week and they are Delicious, I’m in the second week of the candida diet and desperately needed something sweet. Having a couple of these did trick. Love your book…the information has been soooo helpful. Thank you. These are so good and so easy to make. I didn’t have raspberries on hand but used lime, frozen blueberries and homemade coconut butter. These would be fun with different flavor combos too! Thank you!